This morning I ran the Leesburg 5K. Even though I had raced plenty of 5Ks this summer, I was still craving another one. I think I still have some work to do in terms of finding the right pacing strategy for me, and really dialing into 5K race effort. Plus, I knew a lot of my friends would be running the corresponding 20K and I thought it would be fun to cheer for them after I finished. I'm in the process of transitioning my training from the 5K to the marathon. The Firecracker 5K was my most recent 5K, and after that I took some down time. Then I went on the running cruise, and then I got sick. Now I am building a base for marathon training, which means a slight increase in weekly mileage and a good bit of hill work. I haven't done any marathon-specific workouts yet, and I also haven't done any 5K-specific workouts in over six weeks. 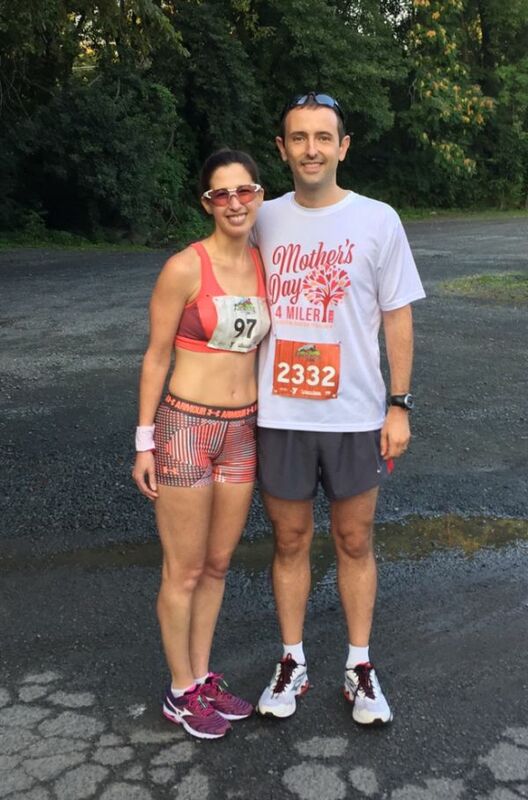 I guess you might consider my half marathon at marathon pace in Alaska to be a marathon specific workout, but I still have not begun high-mileage weeks with marathon focused workouts. Thus, I did not know what to expect in terms of my 5K fitness. I went into the race with a framework of a strategy, but no specific time goal. I was actually more focused on my placement, because I wanted to win =PR= race series points. You win points for placing in the top 10 of your gender, as well as for placing in your age group. I also hadn't run this race in the past, so I had no benchmark. It used to be a 10K, and I ran that in 2009. But I had no recent memory of this race. The majority of my friends were running the 20K, and Greg was running it as a workout. I advised that he run the first 30 minutes easy, the next 30 minutes medium, and the rest of the race hard. Greg and I arrived at the race, got our bibs, and headed for the porta potties. At this point, I think most of my friends were already warming up for the 20K, which started 18 minutes earlier than the 5K. Yes, the official start time of the 5K was 7:48. Very precise! I warmed up on my own, and as I was on my way back I saw the 20K runners coming down the road. I cheered for my friends and for Greg, and then went into a nearby coffee shop to go to the bathroom one last time. It was in the upper 60's, sunny, with about 90% humidity. This was relatively decent weather compared to the very humid weather we've been having lately. On Friday morning, it had been 79 degrees with 98% humidity at 7:30am. All in all, I couldn't complain. It wasn't long before they were calling the 5K runners to the start line. I scoped out the competition and I knew at least two of the women would beat me. It was hard to tell with the others since I didn't know who they were. mile was uphill. Since I was more focused on my placement than my finish time, I counted the number of women ahead of me. It seemed like there were about 10 of them, and I was the 11th. As I powered up the hill I focused on my form and staying relaxed. 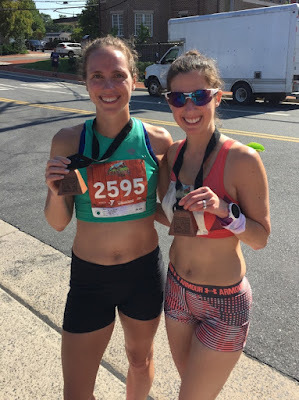 I didn't want to go out too hard like I did at the Firecracker 5K and have nothing left for the end, so I gave a strong effort without going all out. I wanted to have gas in the tank for the last mile, which I knew would be all downhill. There was no shade and the sun was getting higher in the sky. I felt okay, but not as peppy as I have felt in previous 5Ks. It became clear that I wasn't used to running at this effort level because I simply didn't have the power that I had earlier in the season. I didn't judge it though, and I focused on picking off the runners who had gone out really fast. By the time I reached the first mile marker, I had passed four of them, which would have made me 7th. 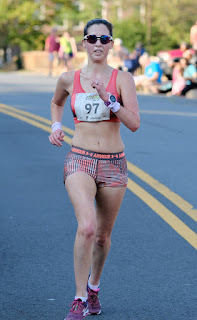 My split was 6:52, which was a bit cringe-worthy, considering my 10K PR pace is around 6:43. I also had run the first bit pretty quickly down the hill, which meant I was running up the hill even slower than a 6:52 pace. But once again, I didn't judge it, I just kept on going. There were lots of twists and turns in mile 2, which I knew to expect from the course map. I had to really focus on where I was going because now there were 20K runners around and I didn't want to miss the 5K turn off because I was following the 20K'ers. There was a split second when I wasn't sure which way to turn, so I said to the volunteer "5K?" and he pointed me in the right direction. I instantly recalled all the blogs I had read where runners made a wrong turn and screwed up their race. But those thoughts passed once I was certain I was following the correct course. I passed another woman at some point during the first half of this mile, which helped boost my confidence. From the elevation profile, this mile is a net 5 ft decrease in elevation, but it felt mainly up hill, at least in the beginning and all the twists and turns made it even more challenging to dial in a strong and steady pace. My split was 6:49, which still seemed really slow given the effort level I was exerting, but I tried to keep positive by reminding myself that it was faster than the first mile. surge when I passed her so that she wouldn't attempt to stick with me. I had lost track of counting the women and was focused on gunning as hard as I could. Finally I felt good and I felt like I was really racing. I just wish I would have been able to go that hard earlier on. When I run downhill, I feel like I am in control of the pace and I can run harder and go faster. This is not the case for running uphill. The trail portion finished and we were back on the road by the time we got to mile marker 3. My split was 6:25. Yes! Now all that was left was that original hill that we ran down for the first 0.1. It definitely was cruel to put such a hill immediately before finish, but I was really motivated to give it all that I had, and was pleased to run a 6:31 pace up the hill. I crossed the finish line and the announcer called out my name. I was relieved that the race was over. After catching my breath and getting some water, I met up with one of my friends, Kathy, who had run the 5K. Before the race, we had planned to do our cool down together. The results were already posted and I was excited to see that I had won first place in my age group, and was the 5th overall female. This would equate to lots of points for the =PR= race series! My placement made up for what I considered to be a mediocre (for me) finish time of 21:18. Kathy had also won her age group, so we were both pleased. We cooled down for two miles and then I retrieved my bag and cell phone so I could take photos of the 20K finishers. Unfortunately, the 5K age group awards were being given away at the same time my friends were finishing the 20K. I prioritized cheering for them instead of getting my award. I knew I could always pick it up later. It was really exciting to see them come through looking strong and working hard. Hannah set a 4-minute PR and Greg executed his workout exactly as prescribed. 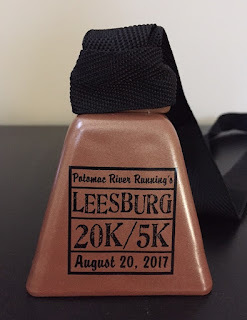 Once everyone was finished, I retrieved my award, which was a cowbell and a gift certificate to Potomac River Running. And then we waited for the 20K awards to be presented. Finally, it was time for brunch. I indulged by having a latte, lemonade, fries, a chicken sandwich, and ice cream! I have mixed feelings about this race, but my overall sentiment is that I got a solid workout in, earned a nice allotment of race series points (and a cowbell), and had a fun morning with my friends. I did feel somewhat stale at the beginning and I was surprised that my paces weren't faster during the first two miles. My finish time was 2 seconds slower than the Firecracker 5K, which was a little disappointing. I think I was in better 5K shape for Firecracker, but given the lower humidity in today's race, and the fact that I didn't execute Firecracker well, I thought I'd at least be able to break 21:00. It's hard to say which course is more challenging, as they both have their share of hills. But as I said earlier, I didn't have any experience with this course whereas I had run the Firecracker course many times in the past. I was encouraged by my speed during the last mile, and I think my stamina is pretty solid right now. 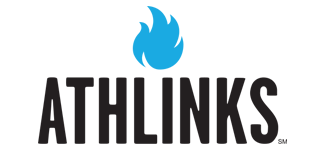 I feel prepared to start tackling 60+ mile weeks, which will start in the very near future. Hannah and I with our age group awards: cowbells! Congrats on a solid 5k and AG award! Especially after your trip and illness. You should feel so proud. Looking forward to following you on your marathon journey. Congrats on a great race! Even if it wasn't a PR and you've run better times, you still had good splits and didn't start too fast and fizzle out (this is what I always do). Plus you ran a great time for not doing 5K specific workouts. I'm glad the weather wasn't too bad for this and everyone had a good time- congrats on the age group award AND 5th female overall- not too shabby! Marathon training just throws everything off for short distances, that's all. Still great placement! Sometimes think you over-analyze it as you ran a great race and accomplished what you intended...place and win the points. You won your AG and you 5th overall, so the paces for the mile splits irrelevant, and probably the slower 1st and 2nd miles is what leaves gas in the tank to ramp it up the last mile and metric finish. 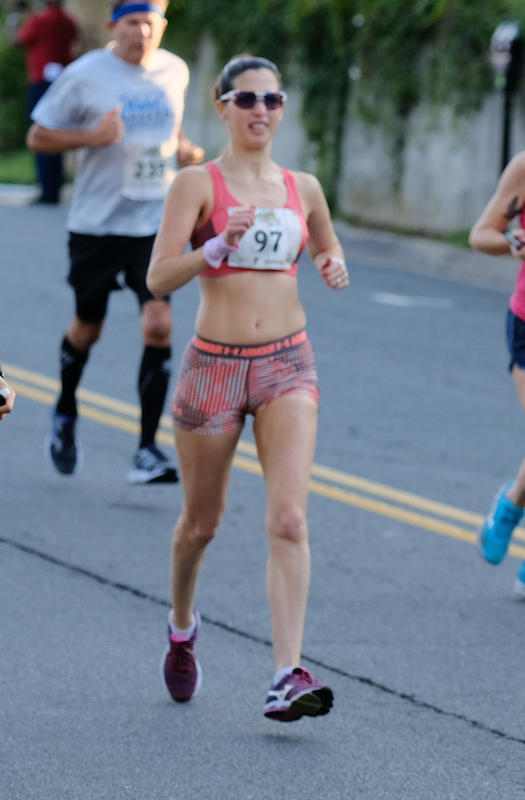 The other thing is training to run marathon distance and mex performance conflicts with what the types of training you do to run 5ks at maximum performance. I am sure you are aware of the contradictions in training regimens to excel at marathon and 5000 meter distances. You can't always do your maximal best in both those race distances when ultimately you training to run a fall marathon at maximal capacity. So great run! Well done! I used to always start 5ks waaaay to fast and then pay for it later miserably. Somehow I've stopped doing that so much but then I'm also not running them as fast anymore either! Congrats on the placing :) you rock!